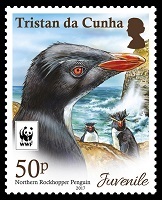 Stamps celebrating the Tristan da Cunha group's breeding population of Northern Rockhopper Penguins. 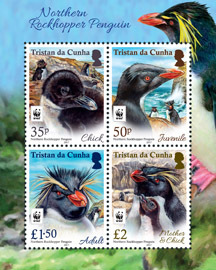 Tristan da Cunha, comprising the islands Tristan da Cunha, Inaccessible, Nightingale, Middle, and nearby Gough island in the South Atlantic are a globally important breeding site for the Northern Rockhopper penguin, Eudyptes moseleyi, supporting approximately 85% of the world population while the remaining 15% are found on Amsterdam and St Paul Islands in the Indian Ocean. 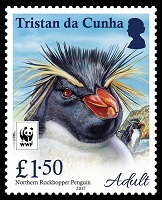 Owing to historic and ongoing population declines combined with the penguin’s small breeding range and vulnerability to land- and sea-based threats, meant that when the Northern Rockhopper penguin was recognised as a full species in 2007 the species got immediately listed as Endangered by the International Union for the Conservation of Nature. 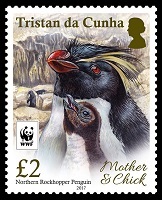 While Gough Island and the Tristan da Cunha archipelago are often grouped as the Northern Rockhopper breeding site in the South Atlantic, the distance separating these islands places Gough as the only breeding site for the Northern Rockhopper penguin south of the Sub-tropical front and hence in Sub-Antarctic waters. For that reason the penguin’s breeding cycle commences about 3-4 weeks later on Gough Island than in the northern islands. Like all crested penguins, Northern Rockhopper penguins are highly synchronous breeders. In the northern islands penguins come ashore to breed at the end of July/early August, with males arriving first, females second. Generally pinnamins prefer the shelter and protection of Spartina tussock grass, which forms the natural habitat on Nightingale, Inaccessible and Middle islands, while on Gough and on Tristan islands rookeries are found on the rocky shores, in gulches or under cliffs. Males and females take turns incubating the eggs for 32–34 days. Once hatched the males guard the chicks for 20–26 days ("guard phase") while the females undertake daily foraging trips to feed the chick. This is followed by the "crèche phase" during which chicks form loose groups and both parents provide food. Chicks fledge 9–10 weeks after hatching. Unique features of crested penguins are that they perform extreme egg-size dimorphism (small first or A egg and a big second or B egg) and an obligate brood reduction. Although there is no difference in hatching success between A- and B-eggs, the survival rate of B-chicks is higher than for A-chicks. Interestingly, the survival rate for A-chicks is mainly affected by the presence of a sibling while the survival of the B-chick is not affected by whether it had a sibling or not. This still remains one of the greatest unsolved mysteries in the animal kingdom: why would one invest in two eggs when only rearing one chick? The first (A) egg is believed to have minimal insurance value in case the B-egg gets lost e.g. due to predation, fights amongst penguins, bad weather conditions or something else. Here the little A chick stands the same chance to survive. Traditionally the Islanders have collected penguin eggs to supplement their September diet. Under the 2006 Conservation Ordinance, eggs are only allowed to be harvested from Nightingale and Middle islands. 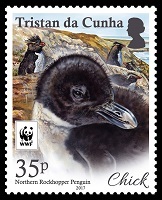 However, after the MS Oliva ran aground off the north-western coast of Nightingale Island on 16 March 2011, as a precautionary measure, the Tristan da Cunha Conservation Department suspended egg collection on all islands. Once a year pinnamins have to renew their entire set of feathers, which is called moulting. 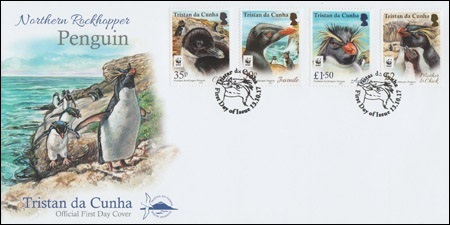 During this time the penguins lose their waterproofing and are unable to go to sea to feed. For this reason, prior to their moult, they go on a long foraging trip to build up their fat reserves. Back ashore penguins often moult at their nest sites and move as little as possible to conserve energy reserves. The newly grown feathers push the old ones out, however not simultaneously, which often results in a rather scruffy and comical look. A gland near the base of the penguin's tail produces oil that the penguin then applies to its feathers. Fluffing and separating the feathers, while spreading the oil around with their bill, is part of the preening process and keeps the feathers smooth, clean and waterproof. Penguins are known to be generalists, feeding on small crustaceans, small fish and squid, giving penguin rookeries their distinct aroma, as the peat soil is enriched with droppings and feathers. This guano is harvested during annual trips by Tristan islanders during late summer to provide fertilizer for their famous Potato Patches. By March/April, after completing the breeding season and having moulted successfully into their new waterproof gear, penguins are ready to leave their breeding sites to embark once again on their annual winter migration.